Our new bolt-on model of mountain bike bell. If you find yourself using your bell on nearly every ride, this is the model for you. Both models of TIMBER offer trail awareness when you need it, silence when you don't. A simple on/off lever controls the internal clapper. Slide it down for on, or up for off. The motion of the bike activates the sound. Designed for safe, friendly passing and signaling on shared use trails, and alerting wildlife, including bears and mountain lions. 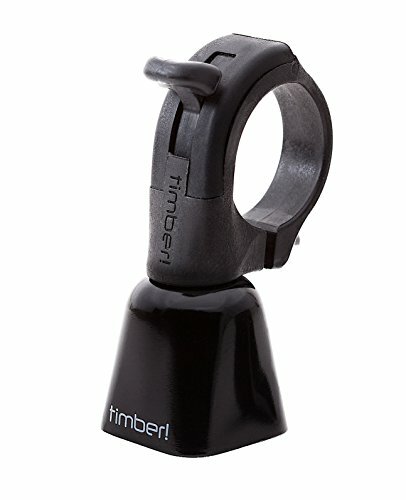 Mounts anywhere on your handlebars using a new 5mm hex bolt. Mounts tight and won't shake or spin on your bars. Mount either at the stem, or near the grips with the included flexible 22.2 mm shim. Installs easily. There is no need to remove the grips, brakes or shifters. New for spring 2017, we've improved the life of the internal index mechanism (on/off switch), and beefed up the strength of the internal clapper cable. We've also upgraded the to a stainless steel bolt, and made in the USA lifetime quality solid brass threaded insert that won't ever strip or wear out. Installs easily. No need to remove grips! Bolt-on model. Mounts tight, won't shake or spin on the bar. If you have any questions about this product by TIMBER!, contact us by completing and submitting the form below. If you are looking for a specif part number, please include it with your message.